For the serious aquarist that wants complete control! 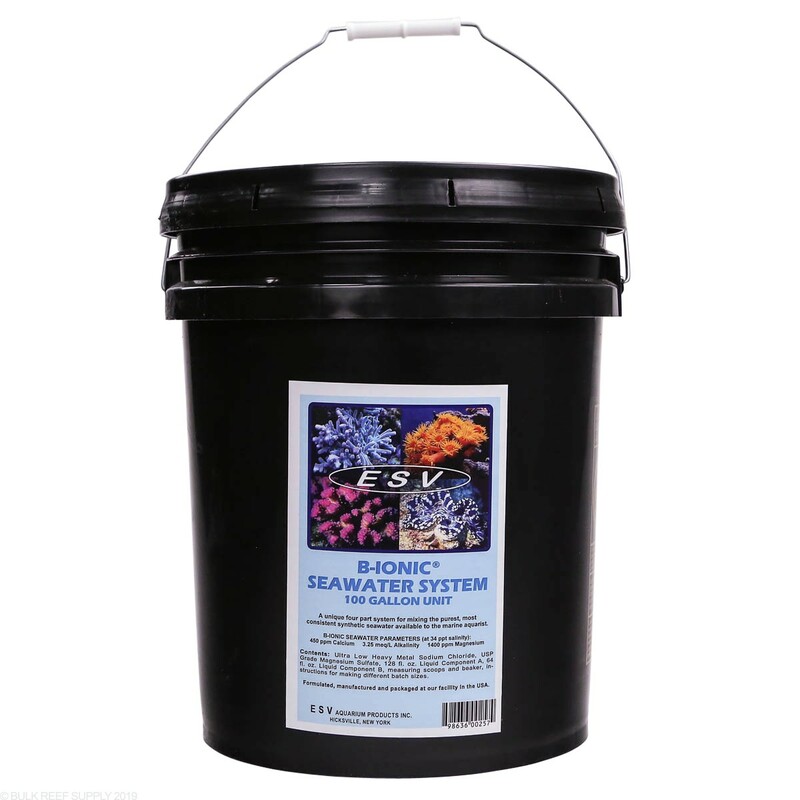 Make your salt the exact way you want it with the B-Ionic Seawater System. 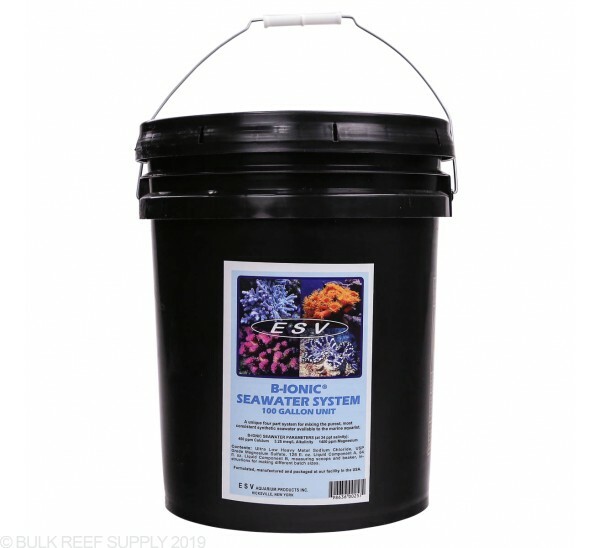 ESV put together an ultra-pure 4-part salt mix that let's make consistent batches of salt from bucket to bucket. 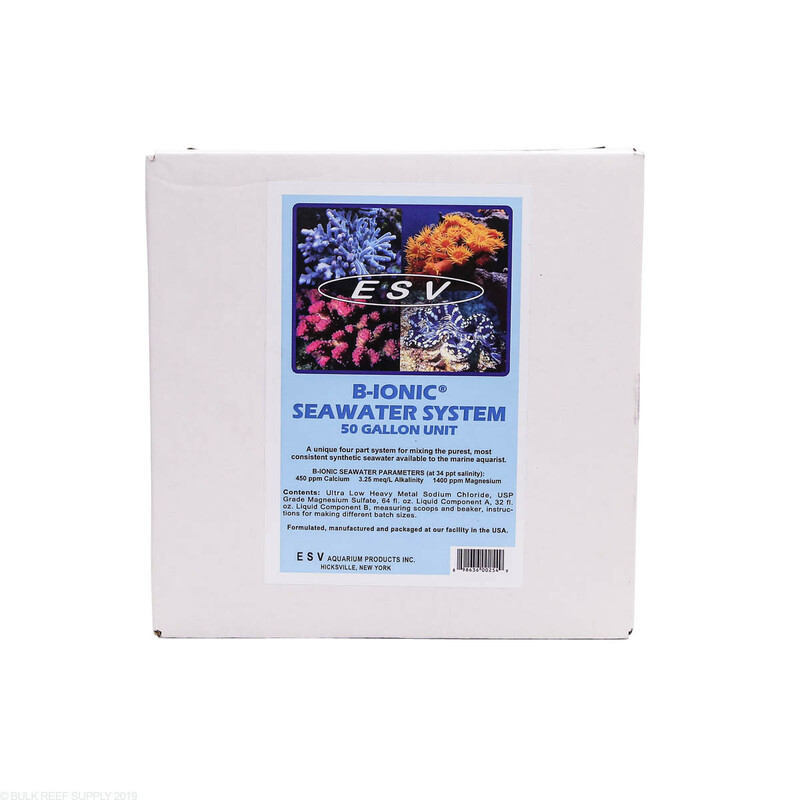 ESV B-Ionic salt lets you create your own consistent salt mix. Other types of salt may not be entirely homogeneous with all the different kinds of salts and dried trace elements in a single mixed bucket. It is very common for salt mixes to settle and not be consistent from batch to batch. The B-Ionic system uses pre-dissolved trace elements in super concentrated solutions that will stay evenly mixed and wont clump in humid environments. Since the hard to dissolve trace elements are already in a liquid solution, batches mix very quickly and can be used within minutes. The only dry portions are USP grade Magnesium Sulfate, and Ultra-Low Heavy Metal Sodium Chloride. Since the only dry parts are completely the same element through and through you never have to worry about settling or uneven batches. Decided to move away from RS due to sludge left in my mixing station. Since I dose ESV B-Ionic decided to combine with their own salt. Got my first batch, didn't know I had to mix each component separately. Sodium Chloride comes clumped up, which made it a little bit harder to mix, as I had to manually break the rocks of sodium chloride apart (it's fine because they don't use anti-caking, but it's a pain in the a** to do it). I even contacted BRS which contacted ESV and they said this was normal and should not interfere in the process of mixing the salt. Well, since I bought 100g bucket, and I did (doing the 3rd one now) 3x30G water changes, I should have enough components left for another 10g change, but no, I ran out of sodium chloride because I kept having to add more of it to get my salinity to 1.026. TLDR: maybe a good salt, but very annoying to mix and, unless you're a control freak that carries around scales and measuring cups to mix this salt, you will most likely regret. Now I will go ahead and toss in the garbage the left over components that I CANNOT USE. Thank you ESV, first and last time I buy your salt (still great on other products tho). Instead of weighing your wet components use a 100 or 220 ml graduated cylinder. Comes out perfect every time. No need to stress over weights and digital scales. Prep takes me about 5 to 8 minutes from start to finish. Stir your water well after adding each component, and you'll have crystal clear water. I have been using tropic marin pro before using this and made the switch. I tried two buckets and was having very bad luck with this salt. SPS started to loose color and turn pale and ended up RTN or STN. Now I switched back to TMP and some of the SPS are getting better. I lost many high end frags such as cherry bomb... I even used a scale (hario) to measure the quantity. There was something in this salt that my tank didnt like. The advantage to this salt is that you do not get settling of ingredients in the container. The disadvantage is that you have to combine the components yourself. Mixing is done in stages and involves careful measuring. The aquarist has to be mindful what, and how much, they put in last so they do not accidentally duplicate a step or use the wrong amount. Writing this information down in a log as you go is prudent advice, one that I should have followed before I made a mistake with one batch. In the end, this salt is more expensive, and requires more work, so I am returning to a more traditional salt mix. Get a water filtration system (Spectrapure is the best) and make your own RO/DI water. Feed water directly into mixing vessel (a 14 gallon food grade container is perfect), aerate with a pump and airstone and mix ESV as needed. Always pure, accurate and no need to wait 24 hours...your fish and corals will thank you. 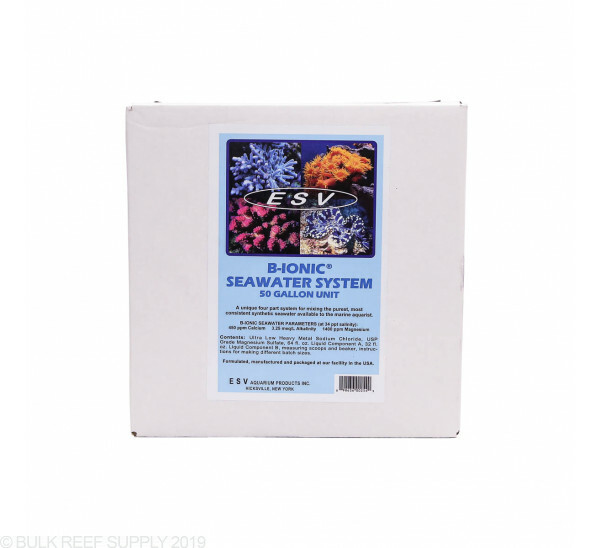 I've used many different salt mixes over the years and ESV is by far the best. It's a bit pricey and a bit more work, but it's worth it to know you're going to get the same results every batch (assuming no user error). I've used ESV primarily for about 5 years. After a tank crashing bad batch of RedSeaPro mix, i made the switch to ESV. It makes perfectly clear, clean, almost clinical sea water. Only negative is that by weighing nacl, mg, 2 part liquids, its a little time consuming labor- but its quick to deploy after making. Parameters match the chart and I can custom blend if need. I usually run out of Mg before my salt is gone, not exactly equal parts. 4- Add each component and mix (let the container mix for 15 minutes before adding the next component - between wet liquid components you can wait five minutes).